Cristiano Ronaldo could give the Kardashians a run for their money because the soccer star is reportedly in talks with Facebook for a new reality show. CR7 is shopping the show to Facebook Watch and could score a $10 MILLION paycheck for 13 episodes according to Variety. And, there's a Tom Brady connection. The show would be produced by Religion of Sports, the media company that did "Tom vs. Time" for Facebook Watch. Ronaldo definitely has an interesting life -- he's got 4 kids including newborn twins that were reportedly birthed by a mystery surrogate in the United States. He's also rumored to be engaged to Georgina Rodriguez -- the mother of his daughter, Alana, who was born just over 7 months ago. Ronaldo's son, Cristiano Jr., is 8 years old and a soccer prodigy who already has an interesting life. 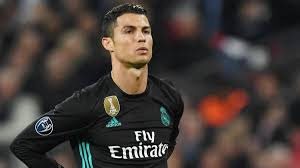 The show would be the latest in a strong of Hollywood projects for Ronaldo -- who's launching a superhero series, "Striker Force 7," based on himself, along with a scripted soccer TV drama series.